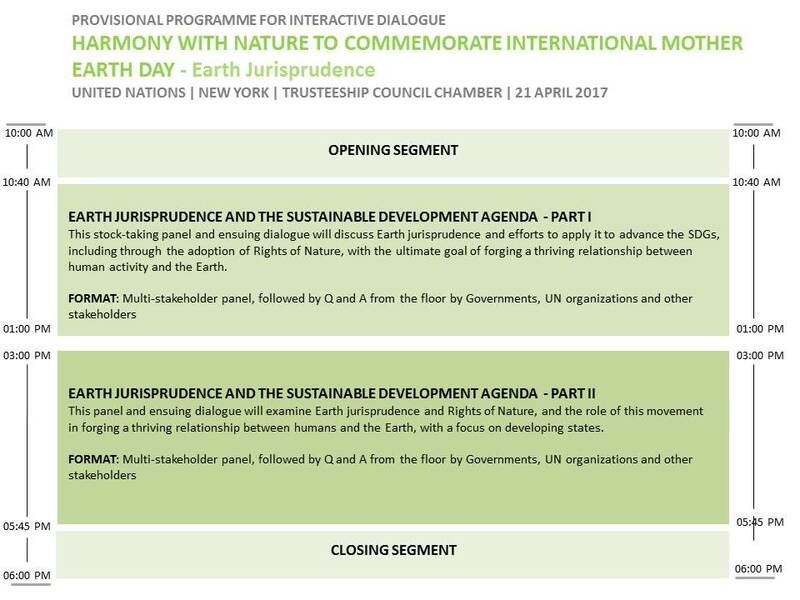 As mandated by General Assembly resolution 71/232, the President of the General Assembly will convene an interactive dialogue on Harmony with Nature on Friday 21 April 2017 to commemorate International Mother Earth Day. The meeting will take place in the Trusteeship Council Chamber. societies to reconsider how they interact with the natural world and to improve the ethical basis of the relationship between humankind and the Earth in the context of sustainable development. The Dialogue will examine the key characteristics of, and implementation strategies for, an Earth-centred paradigm. It will advance the importance of the inclusion and application of Earth jurisprudence principles in the implementation of Agenda 2030 and all 17 Sustainable Development Goals. Panelists will draw from the recommendations of the experts’ report from the 2016 virtual dialogue, showcase how Earth jurisprudence is currently being applied across different disciplines, and offer new Earth jurisprudence implementation strategies consistent with Agenda 2030 and the Sustainable Development Goals. The Dialogue will explore how Earth-centred governance policies could ensure sustainable development patterns consistent with Earth jurisprudence principles. Member States are invited to engage in interactive Panel discussions and are highly encouraged to keep their interventions to less than 3 minutes per speaker in national capacity and five minutes when speaking on behalf of groups.